In Pillar of Fire, the second volume of his America in the King Years trilogy, Taylor Branch portrays the civil rights era at its zenith. The first volume, Parting the Waters, won the Pulitzer Prize for History. It is a monumental chronicle of a movement that stirred from Southern black churches to challenge the national conscience during the Eisenhower and Kennedy years. In this masterly continuation of the narrative, Branch recounts the climatic struggles as they commanded the national and international stage. 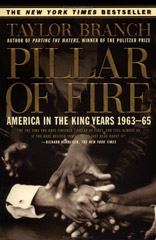 Pillar of Fire covers the far-flung upheavals of the years 1960 to 1965 – Dallas, St. Augustine, Mississippi Freedom Summer, LBJ’s Great Society and the Civil Rights Act of 1964, Vietnam, Selma. And it provides a frank, revealing portrait of Martin Luther King, Jr. – haunted by blackmail, factionalism, and hatred while he tried to hold the nonviolent movement together as a dramatic force in history. Allies, rivals, and opponents addressed racial issues that went deeper than fair treatment at bus stops or lunch counters. Participants on all sides stretched themselves and their country to the breaking point over the meaning of simple words: dignity, equal votes, equal souls. Malcolm X, who challenged King’s vision of nonviolent integration and lived under threat of death from the Nation of Islam. Lyndon Johnson, who believed racial conflict was destroying his political base in the South and threatening his dream to end poverty. J. Edgar Hoover, under whose direction the FBI, with Attorney General Robert Kennedy’s approval, spied on King with wiretaps and bugs, and yet solved the most heinous racial crimes of the era. Diane Nash, the passionate leader behind sit-ins and Freedom Rides, whose determination shaped the Selma voting rights movement. Abraham Heschel, the Hasidic theologian who bonded with King in devotion to the Hebrew prophets. Robert Moses, the Mississippi SNCC leader who finally came undone over the human suffering caused by his Freedom Summer. Fannie Lou Hamer, a sharecropper who commanded a powerful voice for the unlettered. Pillar of Fire takes readers inside the dramas that shook every American institution, from the local pulpit to the Presidency. We disappear with courageous young people into Mississippi’s feudal Parchman Penitentiary. We absorb the shock of a single Presidential election in 1964 that revolutionized the structure of partisan politics. We follow Northern rabbis summoned by King, and Mary Peabody, mother of the governor of Massachusetts, into the segregated jails of St. Augustine, Florida. We witness the Shakespearean conflicts between Lyndon Johnson and King, and Hoover and Robert Kennedy. Branch brings to bear fifteen years of research – archival investigation; nearly two thousand interviews; new primary sources, from FBI wiretaps to White House telephone recordings – in a seminal work of history; Pillar of Fire captures the intensity of the legendary King years, when the movement broke down walls between races, regions, sexes, and religions, and between America and the larger world. Its struggle to rescue and redeem, its victories and defeats, its failings and sacrifices gave rise to opposing tides that still dominate government. The story of this movement is an incandescent chapter in America’s distinctive quest for freedom. Read reviews of America in the King Years.